According to Enerpac (A Division of Actuant Corp) , one of the important factors to be considered while selecting portable hydraulic tools is the power source. Powerful and portable hydraulic tools are increasingly replacing backbreaking and often hazardous manual labour in specific jobs. Many plant maintenance tasks such as tightening or loosening bolts, cutting rusted nuts, spreading flanges or positioning equipment can be made easier by using these powerful hydraulic tools. Hydraulic tools are available in varying operating ranges and capabilities, and the suitability of tools for specific applications depends upon several factors including how they are powered. Hydraulic tools have traditionally been available in three main pump power methods: hand pumps, air pumps and electric pumps with each power source offering distinct advantages. While electric and air-powered pumps offer plenty of power, they must be connected to an available power supply by cords or hoses. Alternatively, hand and battery-operated pumps offer flexibility and portability, but operator fatigue and battery life can restrict the size of job they can handle. Enerpac’s ZU4 series portable hydraulic pumps feature a powerful 1.25kW universal motor coupled with a totally new pump element design that reduces oil flow turbulence, producing an industrial workhorse with fewer moving parts and less friction. Special models can be configured for particular applications including bolting. 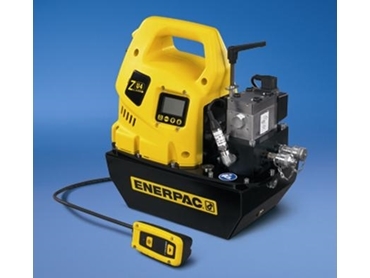 Enerpac’s ZE series of 700 bar electric pumps is engineered to save power and increase reliability with lesser moving parts, enhancing flow characteristics and reducing friction. The high-efficiency design of the ZU and ZE series electric pumps offers higher oil flow and by-pass pressure, runs cooler and requires 18 per cent less current draw than comparable pumps.